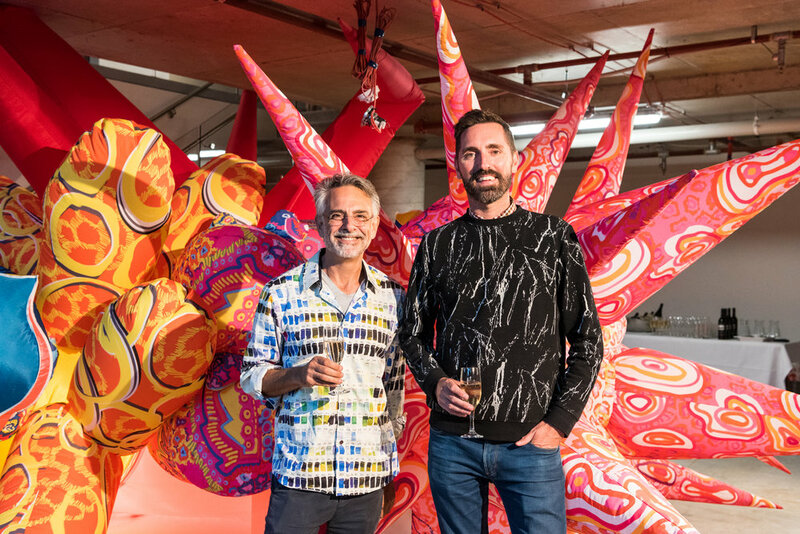 In November 2019 Art Pharmacy Consulting was contacted by longtime clients, Dexus, to create an interactive art project for their 130 Harris Street, Pyrmont space. The Dexus Marketing team wanted an interactive installation, which customers could easily access, interact with and be inspired by. At that point the space was an empty tenancy, and the artwork would appeal to potential tenants. Art Pharmacy Consulting was to find and install an artwork that achieved this. We had previously helped Dexus with large-scale lobby art commissions, artwork hire and office art commissions. Art Pharmacy Consulting came forward with an innovative and simple solution in the form of a temporary art based solution. We approached an artist who could work in modular design (could be easily adapted and changed). They already had the ideal work - a giant, soft spiked blow up work filled with air. Art Pharmacy Consulting also suggested Dexus time the installation with an event that Dexus clientele and potential clientele were invited to. This would maximise content with exposure to a high impact work, while working to a relatively small budget. In terms of Implementation the artist test-installed the work under Art Pharmacy Consulting’s supervision, amde amendments, and then re-installed in time for the event. The work was floor to ceiling, over two floors and bursting out of the space. A decal in window, describing the work, was based off content we provided. The installation was documented by one of our photographers, and shared with the Dexus team. For the event itself the work was lit up from the inside, giving it a beautiful glow. The finished result was a great temporary and time efficient solution to inspire creativity and start solutions.